Matt and Sheri of Healthytreat turned a love of natural ingredients and a small dehydrator into a full-fledged business now operating out of a certified kitchen. Their real fruit leather, fruit jerky and dried fruit treats along with a knack for stunning photography have netted them a loyal following. Matt let me pick his brain (I promise not to turn it into leather) about the details of their sweet partnership. How did you meet and decide to start a fruit business? We met by chance online. Sheri reached out after seeing a picture of me with a dirt bike. 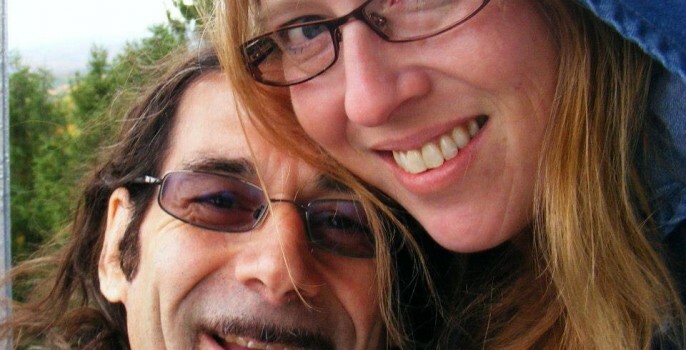 Intrigued by similar interests, we started to trade emails, photography and poems. It wasn’t until a few months later that we met face to face. “Friends first” is our motto and still holds us together 7 years later. Sheri has always been a crafter and sold homemade items at Craft Fairs. 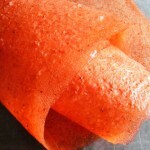 We bought a dehydrator for ourselves and she introduced me to fruit leather – I’d never heard of it. It was so good, I thought we could sell it – the rest is history. Your fruit leather is made in a certified kitchen. Why is this important? In NY State, a ‘Certified Kitchen’ is one that is inspected by the state to ensure cleanliness and safety. Our product is made in a strict and clean environment. We want to stress it since not all food products are made with this assurance. 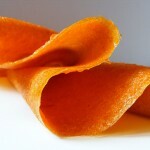 What challenges do you face selling food products on Etsy? Standing out in the crowd can be difficult. We’ve had numerous compliments on the photography, our crazy flavors, our customer relations and our packaging – all of which help us stand out in the sea of crafters on Etsy. Another challenge is keeping our pricing at the bare minimum so we can offer quality products and still make a buck. It’s hard to keep up with price changes in fruit and postal services. We hate to have to raise our prices due to these outside factors, but we have to keep up or sink. What’s been the biggest change to your business since starting on Etsy in 2010? We’ve gotten our shipping and our entire process down to a science. We live and learn just like everyone else, and find that little improvements along the way make the business flow that much easier. 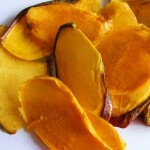 We’re adding another dehydrator this year, so that’s a step in the right direction. How do you maintain the balance between your business and personal lives? Since we’re the best of friends, there is very little difference between our business and our personal lives. We enjoy being around each other – we listen to the radio while we work and carry on great conversations. We also enjoy going to the markets and orchards together. Of course, there’s the occasional bump in the road but we are quick to rectify any situation that’s hard to cope with. One nice thing about having a large dehydrator is that we make oodles of product at one time and then we have the rest of the time together as the product dries. My craft takes up half our home. Are you guys buried in fruit and packaging? We package our products at home – so yes, there is one room that is quite congested with boxes and materials. The Post office is not too far away so we just take the items there. We’ve become quite adept in our storage strategies and making room in the work place. 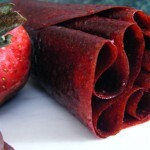 Your strawberry and chocolate fruit leather is right up my alley. Who can be credited for your unique flavor creations? Sometimes we get suggestions from other folks, but most of the time Sheri keeps a keen eye out for trendy or unusual flavor combinations. We have wineries in our area that offer homemade sandwiches. One day we had a sandwich with raspberry/jalapeno jelly – and voila, a new flavor was born! Have you had any unusual flavor requests? Oh indeed! We try to accommodate every request, but honestly we have to decide between practical and whimsical. Almost anything is possible but we have to consider our time and energy involved in making a special requests. We really enjoy making leathers with a personal note ‘written’ into the product, like “Love you”, “Miss you”, or “Happy Birthday”. What is your strategy for bringing traffic to the shop? Sheri’s unique photography has caught more eyes than anything else. We hand out business cards with our link on them. We also try to spread the word while we’re at Farmer’s Markets. Offering unique products and maintaining good customer relations has been the key to our success. I noticed you’re on BNR/BNS teams. Have you found this to be helpful to your business or is it just to explore Etsy and have fun? Both actually – it’s fun to see other’s stuff and to play along but more importantly, it brings attention to our shop. Do you sell your treats anywhere other than Etsy? We have a few local merchants that sell our product and we’re working on more prospects. We try to get to the Farmer’s Markets when we have enough product to sell. We also have a little shop on Copious. Consumable products can be a tough sell online, where shipping can bite into low-priced food items. Matt and Sheri found success with their original recipes, dazzling photos and attention to customer service. 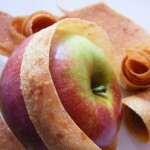 Find their fruit leathers and treats on Etsy at Healthytreat and follow them on Facebook – and take a bite out of sweet mother nature!